Queer Eye for the Straight Guy Season 3 has starting production in Kansas city, Missouri, and will debut in 2019. 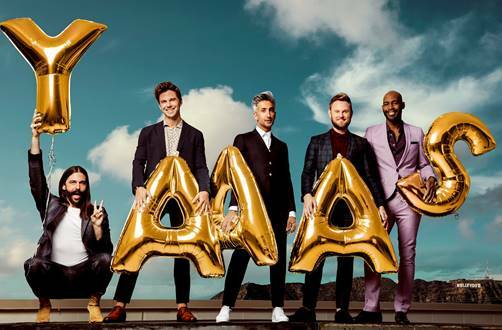 The eight-episode third season began production in Kansas City, MO on Monday,16 July, with co-hosts Antoni Porowski (Food & Wine), Bobby Berk (Interior Design), Karamo Brown (Culture), Jonathan Van Ness (Grooming) and Tan France (Fashion). The make-better series recently received four Emmy® Award nominations for its inaugural return season, with recognition in the Structured Reality Program, Casting, Picture Editing, and Cinematography categories. It’s been fifteen years since the Emmy Award-winning series revolutionized reality television. The series returned to Netflix in 2018, going global and introducing audiences around the world to a modern aesthetic, diverse perspectives, and a brand new Fab Five. Netflix’s new Fab Five are forging relationships with men and women from a wide array of backgrounds and beliefs, often contrary to their own, touching on everything from self-love and faith, to immigration and how to make the perfect homemade poke bowls and more! Queer Eye is executive produced by David Collins, Michael Williams, and Rob Eric, for Scout Productions. Jennifer Lane serves as the showrunner and executive producer. David George, Adam Sher, David Eilenberg and Jordana Hochman serve as executive producers for ITV Entertainment.